Editors: Lundberg-Love, Paula K., Nadal, Kevin L. and Paludi, Michele A. For too long, studies lumped women's mental health with that of men, notwithstanding profound differences. 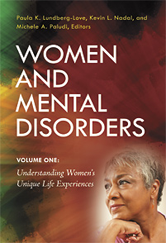 This groundbreaking work decisively addresses that oversight as a team of expert scholars and therapists spotlights common female mental disorders, explores the causes, and explains available therapies.